May 6, 2016 – The Mars Atmospheric and Volatile EvolutioN (MAVEN) mission team, led by Principal Investigator Bruce Jakosky from the University of Colorado Boulder, has asked NASA for a second mission extension. MAVEN launched to Mars on a United Launch Alliance Atlas V rocket on November 18, 2013. Its mission is to discover how the Red Planet lost much of its atmosphere, transforming the planet from one that could have supported life billions of years ago into its present state as a desolate barren desert. The primary science mission for MAVEN was designed to be one Earth-year, but MAVEN carries enough fuel to extend that mission for an additional 29 months and then another six years in a higher orbit, which would be chosen to conserve fuel. MAVEN currently does “deep-dip” campaigns into the lower atmosphere around Mars, but then has to use additional fuel to raise its orbit again. With the success that MAVEN had in its first year, its mission was extended through September 2016. This put the spacecraft in a mission cycle in sync with the wider planetary mission review process. It also meant that MAVEN was able to observe Mars and collect atmospheric data through an entire Martian year and observe any seasonal changes, since a year on Mars is nearly twice as long as that on Earth. Now the MAVEN mission team will meet with NASA officials on May 23rd to discuss a mission extension that would keep the Colorado spacecraft collecting science data at least through October 2018. There are significant additional, high-priority goals that can be addressed during an extended mission. Roughly 30 scientists, graduate students and undergraduates from the University of Colorado’s Laboratory for Atmospheric and Space Physics (LASP) are on the science team and analyzing MAVEN results. CU-Boulder provided two science instruments and leads science operations as well as education and public outreach for the mission. Every CU Boulder student, faculty and alumni was invited to the MAVEN launch, making it the largest non-sporting event in CU history. On Monday, May 2, Nick Schneider gave a presentation to a sold-out crowd at Chautauqua Community House in Boulder. Schneider is an Associate Professor in the Department of Astrophysical and Planetary Sciences at the University of Colorado and a researcher at LASP. He also serves as the instrument lead for the Imaging Ultraviolet Spectrograph (IUVS) on the MAVEN mission. Schneider’s talk was followed by a public presentation at LASP on Wednesday, May 4, by Mike Chaffin, a member of the IUVS team. Both Schneider and Chaffin gave an overview of what the MAVEN team had learned so far and looked forward to continued data and additional insight into the Martian atmosphere. Geologic evidence tells us that water flowed on Mars more than three and a half billion years ago. Features show the remnants of lakes and streams, and the Opportunity rover found “blueberries” on Mars. Blueberries are hematite concretions formed by water flowing through rocks. They are very common on Earth on the border of Utah and Arizona, so scientists have a good understanding of what causes them. To have this much water, Mars would need a much thicker atmosphere to keep the planet substantially warmer than it is today. The question then is where the atmosphere went and what process caused its disappearance. There has been a lot of debate about this, but the MAVEN team thinks there’s a very good case to be made for the atmosphere being lost to space. Soon after arriving in orbit around Mars on September 21, 2014, MAVEN started making some exciting discoveries. Instruments on MAVEN are designed to measure the atmosphere, the strength of the solar wind, and the number and type of escaping particles. 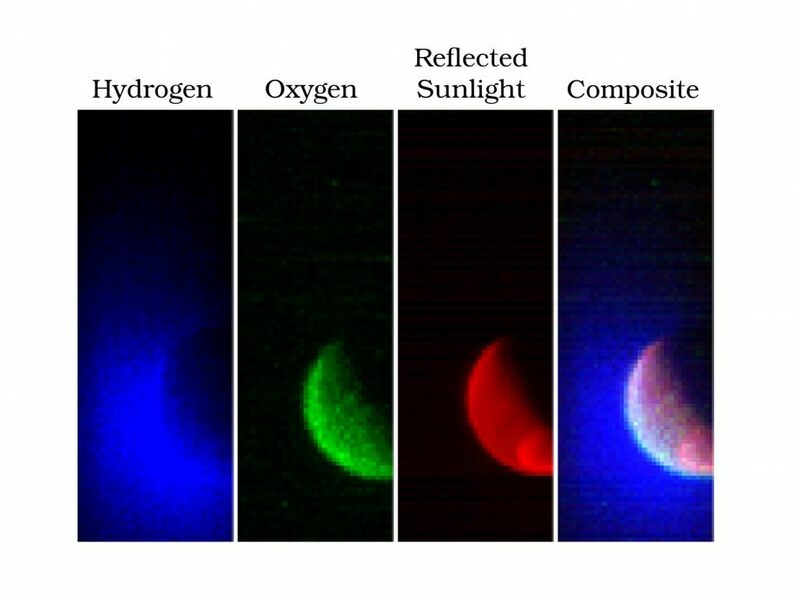 MAVEN has a spectrograph that splits light into its component colors. One of the first observations MAVEN made is that hydrogen is escaping at a faster rate than other elements. Carbon remains close to the planet, while oxygen goes out a little farther. The hydrogen that used to make up water is escaping faster, by virtue of being lighter and less bound by gravity. This data can help scientists understand atmospheric escape and the basis for life on exoplanets. Scientists have started to map the rate of escape across Mars and they’ve found that there is about a 100g/sec net ion escape rate – or roughly a quarter pound hamburger per second every second for four billion years. Nitrogen and oxygen are the most common elements in Earth’s atmosphere. On Mars, it’s mainly carbon dioxide and a small amount of carbon monoxide. There’s not a lot of free oxygen. 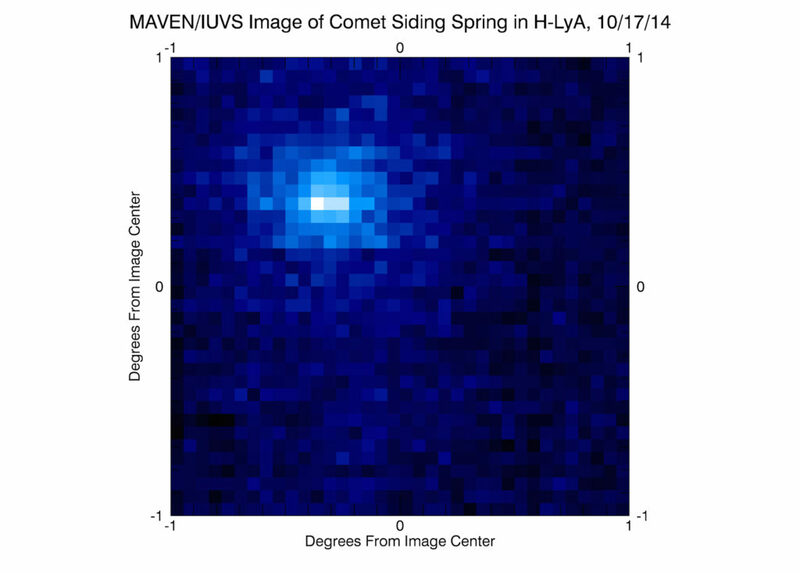 The next big observation for the MAVEN team was the approach of Comet Siding Spring. 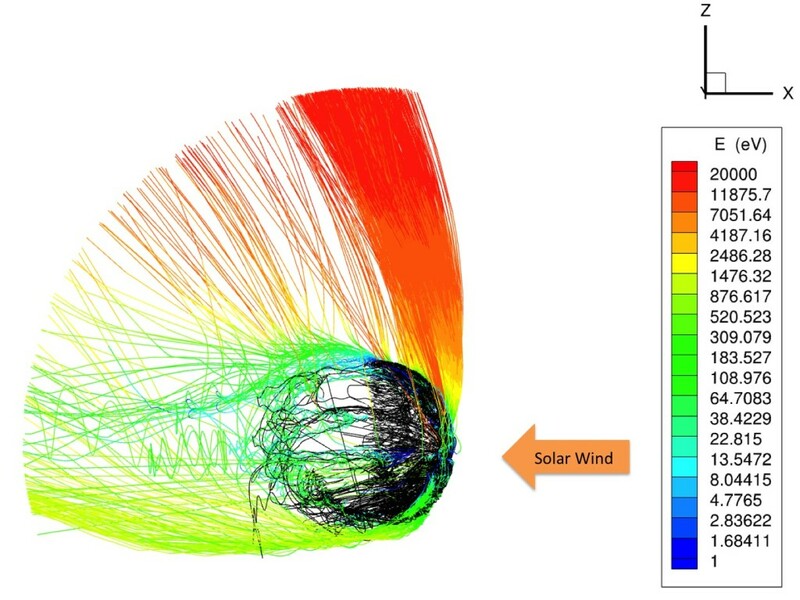 The comet traveled so close to Mars that the planet was in the extended coma. Scientists estimate the likelihood of such an event to be once every 50,000 years or more – and MAVEN got to Mars just in time to record it. Unfortunately, the comet was so close, that if even a tiny grain of dust traveling at that speed (40 miles per second) had hit the spacecraft, it would have been obliterated. All of the spacecraft at Mars went into “hunker down” mode, with the orbiters hiding on the back side of the planet at closest approach. Lockheed Martin got MAVEN back to collecting science data as quickly as possible though, and MAVEN was able to record the full spectrum of the UV from the comet as it passed, giving scientists a lot of useful information. After the comet passed, there were more surprises. “We think Mars was engulfed in a layer from magnesium and also a little bit of iron,” said Schneider. In fact, scientists think it would have looked very similar to the Leonid Meteor Shower of 1833 when thousands to tens-of-thousands of meteors lit up the sky every hour. There is still some magnesium in the atmosphere today, but the amount has reduced over time. Mars is scooping up the grains of metal with each orbit and they’re still burning up in the atmosphere. MAVEN also detects metal ions in the atmosphere directly using mass spectroscopy during its deep dip campaigns. At that level, it’s been able to record many different types of metals. The next big surprise for MAVEN scientists came from December 18-23, 2014 during what is known as the “Christmas Lights” aurora. The magnetic lines on Earth are only open near the Polar regions. As the solar wind interacts with Earth’s magnetic lines, it causes a layer of energized particles known as the Northern and Southern lights, or aurora. On Mars, there is only remnant magnetism (similar to rubbing a nail on a magnet, where the nail will stay magnetic for a short time), so magnetic lines can be open in random places. Scientists knew that auroral displays could occur on the edges of those magnetic fields, but they didn’t realize they could also occur where there is no energetic field. 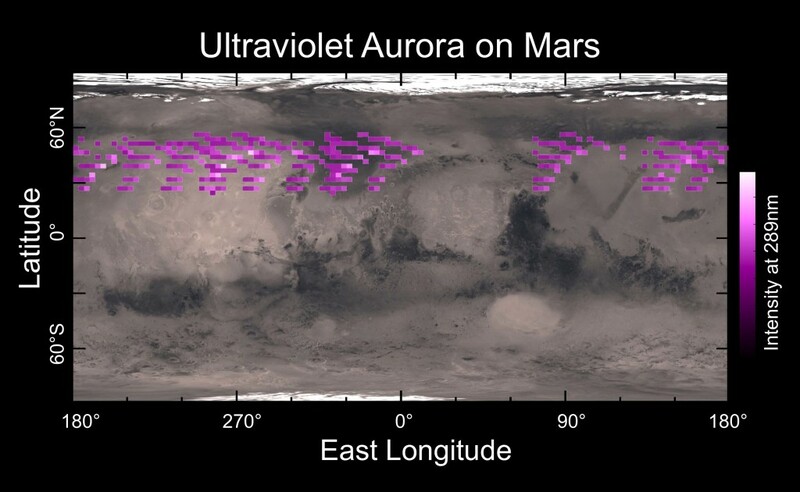 What scientists discovered on Mars was a diffuse aurora, with particles plunging into the atmosphere and interacting at very deep levels. “If you were standing on Mars during one of these displays, you would see an aurora across the entire night side,” Chaffin said. Solar energetic-electron storms are the likely driver of diffuse aurora and the MAVEN team has recorded four of these events so far. Scientists have found that the atmosphere can be energized by solar storms hitting the planet. Atoms in the Martian upper atmosphere become electrically charged ions after being energized by solar and space radiation. Because they are electrically charged, these ions feel the magnetic and electric forces of the solar wind, a thin stream of electrically conducting gas blown from the surface of the Sun into space at about a million miles per hour. The solar wind and more violent solar activity, such as solar flares and Coronal Mass Ejections, have the ability to strip away ions from Mars’ upper atmosphere through electric and magnetic forces generated by a variety of mechanisms, causing the atmosphere to become thinner over time. 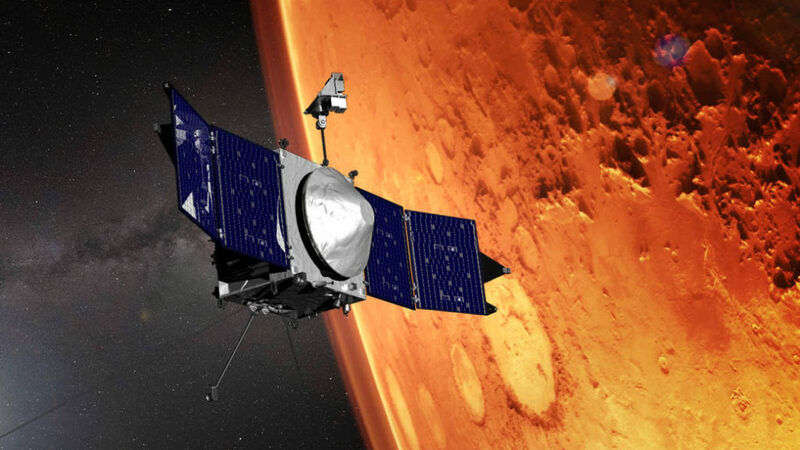 In June or July, MAVEN will look down on Mars and study the dust and haze in the atmosphere. At the same time, Curiosity will look up and record data about the dust and haze from below. Scientists will use the data to learn more about what’s happening to the atmosphere. Scientists will also continue to analyze data from Mars’ moon Phobos, which is doing a death spiral into Planet Mars.